ebm-papst’s success in the market can partially be attributed to our dedication to maintaining engineering resources to support customer projects. Our local technical expertise allows us to provide a level of support that most competitors aren’t able to provide. 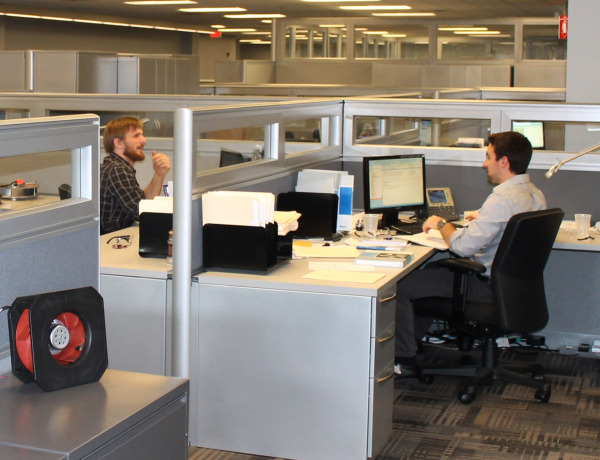 We have several engineering departments within the organization that help make that possible. The Applications Engineering department has the highest head count of the various engineering groups at ebm-papst. Applications Engineers are responsible for providing technical support to all customers within an assigned geographic region. Technical support can range from helping the customer select the proper air mover for their equipment to answering basic technical questions about ebm-papst product. Applications Engineers work with customers from various market segments including HVAC, medical, industrial, IT/ telecom, etc. The diversity of our customer base gives the engineering group an opportunity to learn about various types of equipment. Applications Engineers also spend part of their time working in our engineering lab which consists of several air flow chambers and a semi-anechoic sound room. Customers send their equipment to our lab for baseline testing and optimization. The Applications Engineers coordinate this effort, help perform the tests and report the results back to the customer. The knowledge of ebm-papst product and customer’s applications gives Applications Engineers an opportunity to advance within the company if they perform well. The educational background for an Applications Engineer is typically a Bachelor’s of Science in Mechanical Engineering. Since our product is very much electro-mechanical, an educational background in Electrical Engineering can also be attractive. A portion of ebm-papst’s business is producing value-added assemblies for customers. A value-added assembly can come in different configurations but it generally involves packaging a fan or multiple fans within a sheet metal assembly. The assembly can include various other components such as connectors, filters and specific control boards. While Applications Engineers serve as the project manager for these projects, there are three additional engineering groups that have direct responsibilities for these projects. The Design Engineering group is responsible for developing the value added assembly in Pro-Engineer and creating Bills of Material. They are directly involved in working with the production floor regarding their designs. The Design Engineer will often be seen building prototypes and working with their hands. Design Engineers will also conduct air flow modeling using Computational Fluid Dynamics software. The goal is to optimize the air flow path in simulation so we only make sheet metal one time. Design Engineers typically have a Bachelor’s of Science in Mechanical Engineering. The Electrical Engineering group is tasked with developing control boards that are used in conjunction with ebm-papst fans. Members of the Electrical Engineering group will design the circuits, lay out the PCB so it can be fabricated, write software, build and test prototypes. The controllers developed by this group are most often installed into a value added assembly but can be sold as a separate component on occasion. Members of the Electrical Engineering group generally have a Bachelor’s of Science in Electrical Engineering. The last link in the value added chain is the Manufacturing Engineering group. Manufacturing Engineers are tasked with supporting the production floor with work instructions, developing processes for manufactured parts and creating new tooling. We are constantly expanding our manufacturing capabilities so the Manufacturing Engineers keep busy introducing new technology to the floor. The Manufacturing Engineers work side by side with the Design Engineering group to bring a new product into production. Manufacturing Engineers typically have a Bachelor’s of Science in Mechanical or Industrial Engineering.